Our living room is the place where we hang around with our family and friends no matter what time it is. Hence, we want our living room to be luxurious and entertaining as well. 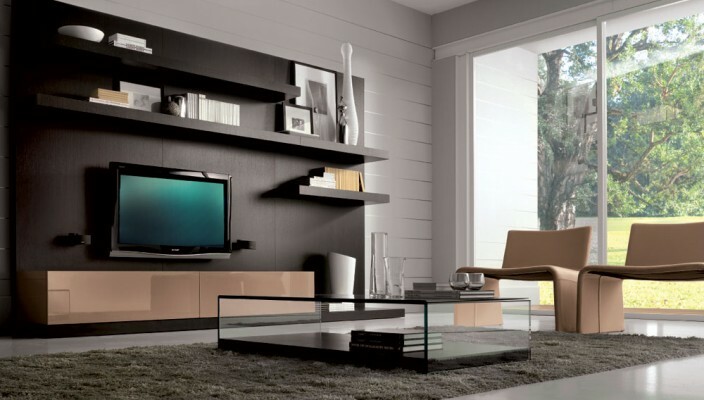 Here is a living room done with the most modern interior decors. The whole room is painted in light grey color that appears to be white in day light and also the floor is also of the same color. The main attraction of this living area is the big brown wall containing the wide LCD screen television. The furniture of the room is done with beige color and is of a very contemporary design. From the glass wall to the glass table this room looks very modern and stylish. The grey carpet on grey floor gives this room a luxurious touch. Although the room is not big enough but looks much bigger because of the glass window and the grey color.